The power of technological innovation is hard at work to improve all spheres of our lives. It is not surprising, therefore, to see innovation changing the way we recycle waste so that the adverse impact on our environment is reduced. A recent example of innovation in recycling and waste management is a plant in West Bromwich designed to recycle AHP (“absorbent hygiene products”) waste. In simple terms, “AHP” includes nappies, feminine hygiene products and adult incontinence products. This is a major step forward because the UK produces close to a million tonnes of AHP waste each year, with nappies alone accounting for almost half. The environmental benefits are enormous, as may be seen from the fact that the average baby uses about 6000 nappies before it is potty-trained and that currently, most of the AHP waste either goes into landfill or is incinerated. Environmentally, that’s like choosing between the proverbial Scylla and Charybdis because each nappy can take as much as 500 years to decompose, while incineration releases tens of thousands of tonnes of greenhouse gases into the atmosphere. The AHP waste recycling process essentially involves separation of materials such as plastic and absorbent polymers from the organic matter and using the former to produce products such as recycled paper, plastic roofing tiles and so on. An important by-product of this process is clean energy. Another example of innovation aimed at enhancing sustainability is the use of anaerobic digesters to process waste food into nutrient-rich bio-fertiliser. The energy that is produced as a by-product can be used to meet the electricity and heating needs of houses in the area. An anaerobic digester facility at Doncaster is expected to process around 45,000 tonnes of food waste to produce 40,000 tonnes of fertiliser and generate enough power for about 5000 homes. If a network of anaerobic digesters is built across the UK, we can achieve a quantum reduction in the amount of food waste that goes into landfill, besides obtaining a steady supply of bio-fertiliser and clean energy. 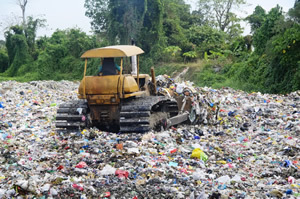 Yet another example of technology-led innovation that enables sustainable development is the use of plasma gasification as an alternative to conventional landfill. This process essentially involves converting waste to synthetic gas and then using a high temperature (6000 degree Celsius) plasma arc to convert the synthetic gas into a vitrified mass (called “plasmarok”) that is deemed to be environmentally benign. Also, the mass of plasmarok produced is a fraction of the original mass of waste. Plasmarok is very strong and can be used in the construction industry. In the UK, the technological feasibility of this process has been demonstrated at a plant in Swindon. An innovative variant of the above technology involves “mining” of existing landfills to extract valuable materials from old landfills. The remaining waste is then treated using plasma gasification to produce energy and “plasmarok”. This concept is being implemented in a Belgian landfill site, where it is estimated that 45% of the roughly 16 million tonnes of waste can be converted to “materials from waste’. When the project is fully implemented, it is envisaged that the ugly landfill site will be transformed into a park-like area suitable for community use.